자치통감강목 권19의하(資治通鑑綱目 卷十九之下)는 송나라 주희가 사마광이 지은『자치통감』에 대해, 춘추(春秋)체재에 따라 사실(史實)에 관하여 큰 제목으로 강(綱)을 세우고 그 사실의 기록을 목(目)으로 구별하여 편찬한 중국의 역사서이다. 세종은 이 책을 애독하여 집현전 문신에게 훈의(訓義)를 만들게 하는 한편, 세종 20년(1438)에 이를 간행토록 명하였다. 그리하여 강(綱)에 사용한 큰 글자는 수양대군(후의 세조)에게 명하여 주조한 병진자로, 중간글자와 작은글자는 갑인자로 찍어『훈의자치통감강목』을 간행하였다. 이 판본은 총 139권 권19하(下)에 해당하는 것으로, 그 뒤에 간행된 책들은 병진자의 원래 활자를 쓴 것이 없고 거의 목판본으로 바뀌었는데, 이 책은 그 유일한 활자본으로 보물 제552호로 지정되어 있다. 책 맨 끝장에 ‘옥연묵장’이라는 인장이 있는 것으로 보아 경북 안동에 있던 옥연재라는 서애 유성룡 선생의 서재에 소장되었던 것임을 알 수 있다. This is an itemized comprehensive mirror of Zizhi tongjian by Sima Guang, written by Zhu Xi during the Song Dynasty (the original Chinese title is Zizhi tongjian gangmu). Historical events recorded in Zizhi tongjian are re-organized in this work under large headings (‘gang’), then under subheadings (‘mok’). This copy is a Joseon edition published in 1438 (20th year of King Sejong’s reign) on the order of the king and contains commentaries added by the scholars of Jiphyeonjeon. 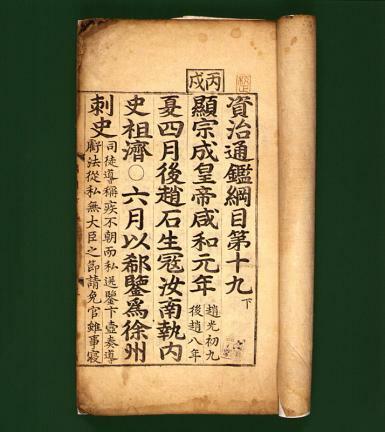 For the printing of this book, the Byeongjin type, the movable metal type cast under the supervision of Suyang daegun (later King Sejo), were used for large characters in the main headings, and the Gabin type for medium-size and small-size characters. This book is Book 2 of the nineteenth of one hundred thirty-nine total volumes. The Byeongjin type was no longer used for books that were printed after this one with most of them printed with woodblocks instead. This book, the only surviving movable type-printed copy of Jachi tonggam gangmok, has been designated as Treasure No. 552. The seal mark at the final sheet of the book that reads “Ogyeonmukjang” indicates that this copy belonged to Ogyeonjae, the private library of Yu Seong-ryong (pen-name: Seoyae).